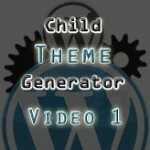 If you are reading this page, then you are in the right spot to get started creating your own WordPress child theme using my WordPress Child Theme Generator. This tutorial series will take you through the entire process from creating the Child Theme with the WordPress child theme generator, to installing and customizing the child theme. A WordPress child theme allows you do do many things that you cannot do within standard themes and once you learn the basics, you will be amazed at the control that you have over the fine visual details of the site. Just to give you an idea, I was able to style the image icons below using the WordPress child theme. The positioning and the hover affect were both possible because of the flexibility of the child theme. Use the tutorial series icon links below to get started with your own WordPress Child theme.